Christmas is known to be one of the happiest holidays of the year, but with all of that excitement and anticipation follows much exhaustion. Traveling, cookie consumption, work parties, and family gatherings may have you longing to end the year with relaxation. Why deal with going out to more parties on New Year’s Eve when you can have just as much fun in your own home, without the traffic and chaos? 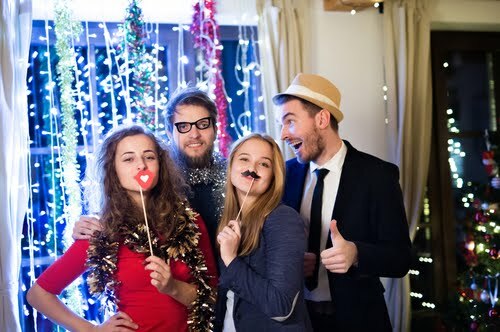 This year, try out some of these ideas and throw your own New Year’s Eve party without leaving the comfort of your house! What better way to bring together friends and family than to compete in a variety of games? Make a game night out of your New Year’s Eve party and unearth some oldies but goodies! Queue the nostalgia and feeling like a kid again with some of the classic games. If you’re not a fan of board games, then try out different multiplayer video games like Super Smash Bros.! Want to move around and take the competition to the next level? Make your own episode of Minute-To-Win-It with homemade versions of your favorite games. The choices are endless, so make your night special and one to remember! Bring all the fun of a bar or nightclub to your own living room! 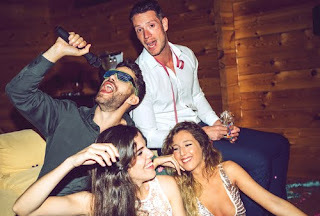 If you’re the type of person who loves the nightlife and everything it brings, then get yourself a karaoke set and prepare your guests for a dance party of the ages. Take turns singing the classics or current hits, and your audience can dance along until the clock strikes midnight. The best part - you don’t have to worry about strangers judging your performance! Spend this New Year’s Eve with friends and family who are just as good or bad as you are! Movie or TV Show Marathon! There are so many options that any genre of movie lover will enjoy discovering their new, New Year’s favorite! Who says costumes just have to be for Halloween? Everyone loves parties where they can be someone completely different! Ring in the New Year by dressing up as your favorite character, or by celebrating a past decade. Step your theme up a notch by celebrating popular trends from the past year, so everyone can come together and share what they loved most! Commemorate your party and everyone’s amazing costumes by incorporating a large photo booth, filled with wigs, signs, and other props that will bring an extra layer of fun to your photo albums. It’ll be a party that no one will forget! Why spend so much money on a trip to Las Vegas when you can bring the casino to your living room? Invest in a poker table and take on the roll of dealer while your friends throw their money into the pot. Don’t want to bring money into it? Go with a classic, family friendly version and bet on candy or cookies! 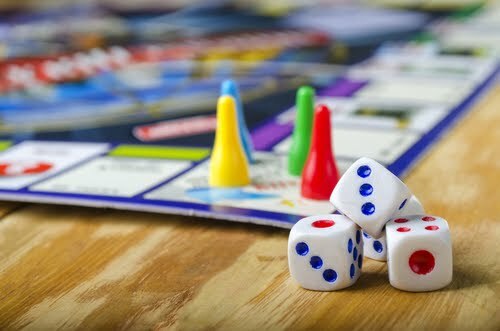 Try out different combinations of card games and rules, and just have fun without the worry of losing all your money to the casino! Families with children need to have some fun during New Year’s Eve, too! Why not throw your own pajama party that your kids will love? Lounge around in your favorite and most comfortable pajamas, order some pizza, and watch some of your favorite family movies with the kids. Make the party more memorable by building a pillow fort or setting up an ice cream sundae bar! Just because you’re an adult doesn’t mean you can’t act like a kid again. Finish out the year without the burdens of adulthood and just enjoy time with the ones you love most. Do you love the finer things in life and want to finish out the year in style? Consider throwing a fancy cocktail party! 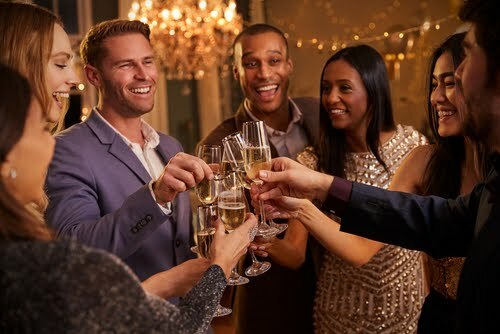 Invite your friends over for a lavish party, complete with formal attire and specialty cocktails! Hire a bartender or experiment with your own skills to make amazing drinks you don’t have to fight the crowd or break the bank. It’s all the fun of a high-class bar in the comfort of your home! Sip on the drinks inside your home theater and watch the ball drop while you reminisce and gossip with all your friends! No one says that staying at home can’t also be a classy affair. Throw a party that incorporates mystery, fun, and activity that everyone can enjoy! This classic party theme is one that will not go out of style any time soon. Take your guests on an adventure as their classy dinner party turns sinister and they have to scour the house for clues to solve the mystery at hand. One of the most classic themes would be the “murder” of a guest, but you can get creative and take the mystery wherever you please! It is your party, so make it one unique and all your guests will be invested in! New Year’s Eve is a time to reflect on the past year and ring in a new one on a joyous note, so plan a party that no one will soon forget! If you need to take your setup to the next level, go to Seatcraft.com and design your home theater or living room with the best seats! Bring comfort and style into your New Year, and many more New Years to come!